After months of planning, designing and growing, all of the hard work paid off this morning when Burncoose Nurseries received the news that they had been awarded a well deserved Silver Gilt Medal for their ‘101 Plants from China’ Garden at the RHS Chelsea Flower Show. 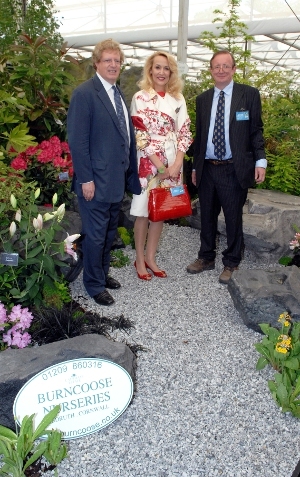 Commenting on the Chelsea medal win, Owner of Burncoose Nurseries, Charles Williams, said, “Every year our garden design team works tirelessly, not only to come up with an inspiring garden theme, but to create a beautiful garden design and nurture hundreds of plants to make sure they are all at their best for the show. It is a mammoth task and I am incredibly proud of all the hard work they have put into this garden. Designed by Louisa Lazarowicz and Geraldine Hammond, the garden, which was once again supported by Terra Firma Capital Partners, was created to illustrate how many of the most popular everyday plants in our herbaceous, ornamental and woodland gardens were in fact first discovered only 100 or so years ago in Southern China and its historical outlying provinces. The 101 plants from China on the Burncoose stand represent the work of the great plant hunters, Ernest Wilson, George Forrest and Frank Kingdon-Ward who travelled to China after 1905 on often dangerous and difficult expeditions to collect seeds from new and unknown species of plants. These expeditions were funded by nurserymen, horticulturalists and landowners who remained safely back in the UK. As well as creating a garden to showcase 101 plants from China , visitors to the Burncoose stand were able to see a collection of original photographs which were taken on some of George Forrest’s 11 expeditions to China between 1905 and 1932. These photographs come from the Williams family archive on the Caerhays Estate (of which Burncoose Nurseries is part) and were sent back to Cornwall by George Forrest to J.C. Williams of Caerhays Castle , the great grandfather of the current owner, Charles Williams. These pictures of life in China at the turn of the 20th Century and the plants that the collectors discovered in different habitats are unique and have never been seen by the public before.